Schedule Yoga On Tap class every Tuesday 6:30pm at The Olde Mecklenburg Brewery. Michelle Ramseth I am the Teacher Community Builder at Yoga One and a 500-hour Certified Baptiste Teacher. I started practicing yoga in 2004. Once a week I left the business of my head and relished in my body with about 10 other ladies - most of them over 60. I did this type of restorative yoga for 2 years and saw dramatic shifts in my life. I began to notice there was more available to me than the pressures I felt from work and past mistakes. I was able to notice others. Then I found Yoga One. I was ready to wake up to life, to be moved, to recognize my inner teacher, to get the party started. I took Yoga One’s first 200 hour teaching training in 2008 and fell in love with the process of teaching, Yoga One’s culture and Baptiste Yoga. I have been a dedicated student of Baron Baptiste since 2009. I am grateful to be a student of this practice and of life, possibility, playfulness and love. This practice has given me the space to be a loving wife and adventurous companion for my husband & two amazing dogs. Together, we live life large - whether it’s canoeing in the wilderness, rock climbing in the desert, banging chains on the disc golf course, or simply looking each other directly in the eye and saying Yes to being together. Each day I celebrate life. I celebrate in the classroom through self expression and willingness to be seen by you - my favorite teachers. Life is a joyous adventure. Come join me! After Climbing the corporate ladder in New York City for 15 years at a midtown Manhattan hotel as the director of Sales and Marketing, Suzanne surged into the athletic world. She completed seven New York City Marathons before begining her yoga journey in 1993 in New York City practicing Ashtanga yoga with Beryl Bender Birch and has been hooked on yoga ever since! In 1997, Suzanne moved to Charlotte with her husband and triplet boys and began practicing Power Yoga with her neighbor, Grace Morales. She completed Power Yoga and Hot 26TM Yoga teacher trainings with Grace in 2005 has attended workshops with Bryan Kest, Seane Corne, and Rolf Gates. She has been a lead teacher at Charlotte Yoga for 10 years, has had the honor of representing Lululemon as an ambassador, and was named “Charlotte’s Most Moving Instructor” by Class Pass in 2016. Suzanne has expanded her fitness prowess and started competing in stair climb races across the country. She is currently ranked among the top 15 female tower runners in the U.S. Suzanne and her husband, Joe are the race directors of The Stephen Siller Tunnel to Towers Stair Climb held at the Duke Energy Center. This year's climb will be held on Saturday, April 28 at 8:00 am. She will share more information about the climb with us on during her class at Yoga on Tap! By incorporating the physical and spiritual aspects of yoga together, her classes link the application of alignment, meditation, intention and prayer, creating an inner journey towards healing and empowerment. The Stephen Siller Tunnel to Towers Foundation honors the sacrifice of firefighter Stephen Siller who laid down his life to save others on September 11, 2001. We also honor our military and first responders who continue to make the supreme sacrifice of life and limb for our country. On September 11, 2001, Stephen, who was assigned to Brooklyn’s Squad 1, had just finished his shift and was on his way to play golf with his brothers when he got word over his scanner of a plane hitting the North Tower of the World Trade Center. He returned to Squad 1 to get his gear. Stephen drove his truck to the entrance of the Brooklyn Battery Tunnel, but it had already been closed for security purposes. Determined to carry out his duty, he strapped 60 lbs. of gear to his back, and raced on foot through the tunnel to the Twin Towers, where he gave up his life while saving others. 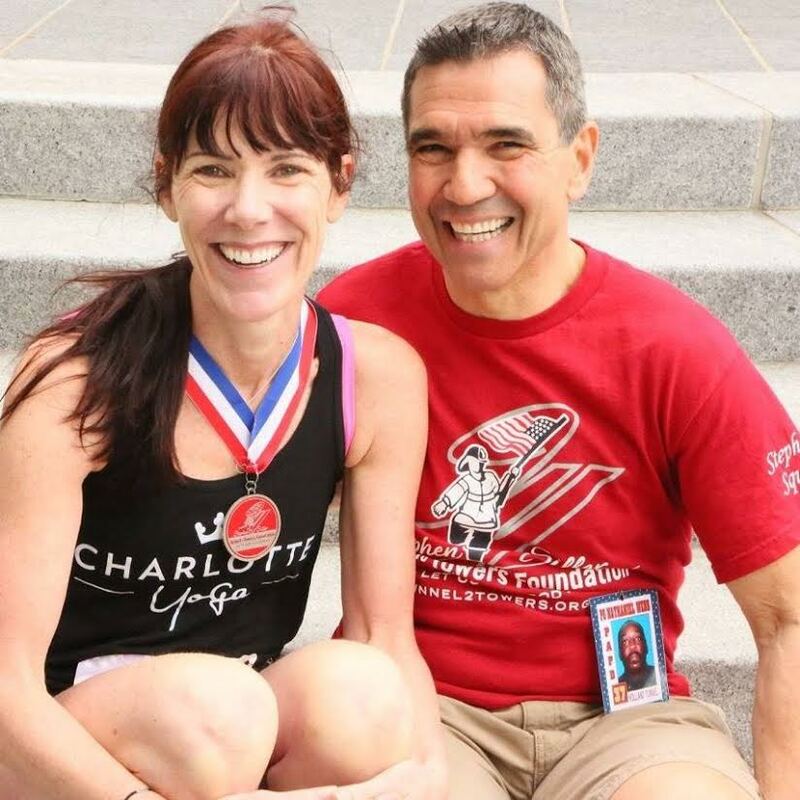 In 2016, Suzanne Bergen, long-time Charlotte area yoga teacher, and her husband Joe, a FedEx pilot, volunteered to direct the first Tunnel to Towers climb outside of NYC. The foundation has been steadily increasing its race series across the US, and the Charlotte climb has gained more traction each year. Suzanne and Joe have their roots in NYC, having lived there for years, until their triplet sons were born, and they moved to Charlotte 20 years ago. The 3rd annual Charlotte T2T climb will be at the Duke Energy building on Saturday, April 28 at 8:00 am. Participants will climb 50 floors to remember those who gave it all on 9/11, and who continue to sacrifice for us every day. Proceeds from the climb will fund Building For America's Bravest. A program that provides mortgage-free smart homes for catastrophically injured servicemen and women. The Stephen Siller Tunnel to Towers Foundation builds mortgage-free smart homes for our most catastrophically injured service members. Each home is custom designed to address the unique needs of each individual. Smart homeshost a myriad of features such as automated doors and lighting, wider halls and doorways, special showers to accommodate wheelchairs, automatic door openers, cabinets, counters, and stove tops that can be raised and lowered, back-up generators, and central heating and air conditioning systems that can be controlled by tablets. These homes enable our most severely injured heroes’ live better, more independent lives. Kati completed her first teacher training in Bikram yoga in 2015, and trained in Vinyasa Yoga in 2016 at Asheville Yoga Center. She has been teaching yoga full-time for two years. Kati has over 1000 teaching hours in the studio and is particularly passionate about working with athletes. She is a student of mindfulness breath awesomeness and enjoys incorporating this into her classes to help people get back into their bodies. Catch Kati's classes at Charlotte Yoga! Shane teaches yoga in Charlotte at Yoga One, Y2 and nationally, East to West coast with hopes that students will leave feeling empowered and ready to take charge of their own life. He believes all workouts should have a strong focus on physicality, mental challenge and most of all, fun. His classes powerfully combine all three element to create a challenging, all levels yoga flow. You will leave his class feeling open & energized. When Shane is not on his yoga mat you can find him teaching at Flywheel Sports (indoor cycling), training for a 5K, watching Netflix with his dog, Ivan, or at a OMB enjoying a beer. A running injury and a need to add more stretching to her workout regimen ultimately led Kristi to yoga. After a few classes Kristi was hooked and realized she could not be complete without incorporating yoga into her daily life. Through yoga, Kristi has learned that happiness is not found in a person, place or thing and that, instead, it is found inside herself. Kacy Pleasants is leading Yoga On Tap September 26th! Get ready for a physical and metal class that's filled with lightness and humor! "I am a wife, a mamma to two sweet boys, a teacher and the Leader of Teachers & Assistants at Yoga One. I took my first yoga class 18 years ago and after a period of time away from my mat, came back after the birth of my first child ten years ago. What was initially exercise to me when I first found yoga became more than just that. My time on my mat became “me” time away from the demands of parenthood, work and life. It was time that was quiet and gave me space to reconnect with my physical body, explore who I was and what I wanted. My practice was a fire- starter for waking up to my life, what I wanted and how I wanted to be for myself, my family and my children. My practice has given me physical strength, awareness and tools to make big changes in my life. Teaching yoga is a dream come true. I come from a family of teachers, it’s our craft. I’m so lit up getting to teach students. Seeing my students wake up to their bodies, their lives and take on their own growth is inspiring and wonderful. I lead and teach from experience, intuition, authenticity and FUN. My classes are powerful, fun, accessible to ALL and full of possibility. I am a Certified Baptiste Yoga Teacher, a Certified Pre/Post Natal teacher, a graduate of Baptiste Level 1, II, Art of Assisting, Advanced Art of Assisting and 200-hour training at Yoga One in Charlotte." Liza is so grateful and excited to be back at Yoga On Tap! Most days you can find her running around barefoot, splitting her time between teaching at Charlotte Yoga and Yoga One. Liza first fell in love with yoga through taking Bryan Kest's classes while living in Santa Monica, CA. Years later she moved to North Carolina and completed her first 230 hour TT with Stephanie Keach at the Asheville Yoga Center. She then went on to train at Yoga One and with Baron Baptiste. She believes in serving the world by using yoga to encourage people from all walks of life and is passionate about using her classes to spread the message that each of us is whole and complete just as we are. Come to class prepared to laugh, to work, to connect with people around you and to leave with a deeper sense of how you feel. When Liza isn't in the studio, she is probably playing outside with her dog Gemma, loving on her husband Chris and day dreaming about filling up her passport. I have been loving and teaching yoga for over 15 years. Within the past four years I have been teaching for the Life Time Matthews club. I was quickly drawn to Life Times yoga style LifePower Yoga. My first LifePower yoga class was taught by Jonny Kest the mastermind behind this yoga style. Our LifePower Yoga Vinyasa is a dynamic and challenging flow that helps bring participants to their edge. We create space to allow the student to let their breath drive the free flow of moments. I am a certified LifePower yoga instructor as well as a certified LifePower Yoga faculty member. I have a passion to bring people into this practice to love the freedom of movement and liberation to truly find themselves in their practice. I am a career hairdressing session-master and started practicing yoga in 2008 to balance the stress of running a busy salon and working in the world of fashion runways. My initial perception of yoga was that it was for those who had lithe, flexible bodies, or those who started yoga early in life. I had spent most of his life overweight, out of shape, with a history of unhealthy addictions to chemicals and food. My first class was a one-on-one and from that first class, I knew I’d stumbled on something different, but I had no idea how profound this journey was going to be. I’m continually amazed by how a rubber mat and an open mind can do so much. Through the unconditional support, guidance and encouragement of wonderful teachers I’ve broken through mental and emotional boundaries and transformed my physical body. The practice, teaching and assisting of Baptiste yoga is a beneficial factor in the quality of communication I have in all areas of my life. I graduated Yoga One Teacher Training in March 2013 with 200 RYT and have worked hard to attain 200 hour Tier One Baptiste Certification and Advance Art of Assisting through Yoga Alliance and the Baptiste Power Institute.. I am delighted to be working in this field of personal growth and expression with such a wonderful family of students, assistants and teachers. I am committed to reciprocating the gifts I’ve received by sharing and leading others in their own journey. Get to know Amy... "I began my yoga practice about 10 years ago, after the birth of my twins. I have 3 children, and at that time, they were all under 3 years old. A friend suggested it to me as a complement to running for the stretching. I wonder if she could tell I needed the peace aspect the most but knew I would run from that. I had tried yoga on and off over the years, but as a runner, I thought it was much too slow for me and the “quieting of the mind” teachers would talk about only made me think of all the other things I should be doing. This time, however, I stumbled upon a teacher that made the class physically challenging BEYOND measure. I kept returning to her class and somehow picked up on the importance the breath, the idea of locking my core and maintaining focus and it became super challenging and gratifying. The steadying and stillness of the mind has benefited me the most though. Well, I do really love having hard abs too. But, now I know that is the practice – to quiet my mind IN THE MIDST of everything else…to come back to breathing when I want to lose it or give up, to find my feet on a solid foundation in the present moment…not behind me or ahead worrying about other things outside of the second I am living in and to be mindful of each of my movements as I go through them. If it sounds like a lot more than a stretching class, that’s because it is. The mind/body/spirit connection makes yoga my moving meditation and prayer. The first 3 Oms we take in class remind me of God’s omnipresence, His omniscience and His omnipotence. The Namaste reminds me to see the light in others and reflect that back to them. I feel humbled and grateful every single time I get to hit the mat. Maya Angelou says one of my favorite quotes, “What you learn, teach. What you get, give.” My hope is that the staples of the practice manifest through my life off the mat as well. Namaste and Love!" You can catch Amy's classes at the Harris YMCA and Yoga One. Shannon has been teaching yoga all over Charlotte for the past 5 years. For Shannon yoga is the opportunity to create a new relationship to her mind and body with focus and breath. She is a Baptiste Methodology inspired instructor and loves to connect with students through laughter and possibility. You can catch her classes at Yoga One, Charlotte Athletic Club and Melting Point Hot yoga. She also teaches the Chip Ganassi Pit Crew team for NASCAR. "Yoga has taught me to appreciate and love myself in each moment, that is truly where my power lies". When Shannon is not sweating on her mat she is acting, hosting tv shows, or on set in commercials. Yoga has helped her career in learning to show up powerfully and with confidence in whatever project she is working on. She lives on Lake Norman with her husband and loves spending time on their boat or cuddling her dog Opie. "Connecting with students has taught me how to connect to all areas of my life, I look forward to growing with all I come in contact with!" In 2010, Bridget began practicing yoga in hopes of relieving the stress of graduate school, as well as dropping a few pounds before her wedding. It took only a few classes for her to become engulfed in the physical, emotional and spiritual practice of yoga. Soon, she wanted to want to share her passion with others. Cara loves to be active, which translates into her yoga practice and teaching style. Coming from a dance background, her classes guide students to find their body's own alignment while flowing with their breath and listening to their inner teacher on the mat. Terrie has a smashup fitness background including, dance, gymnastics, competitive aerobics, martial arts, and has taught about every type of organized exercise class possible, to include providing over two decades of personal training. However, she believes nothing holds a candle to yoga because in her words, the asana (physical practice) helps improve flexibility, strength, balance, posture, body awareness, cardiovascular endurance, and so much more. ANN GREW UP WITH A LOVE OF DANCE. HER INTEREST IN FITNESS CONTINUED TO DEVELOP STRONGLY AFTER COLLEGE. AN AVID RUNNER AND “BOOT CAMPER” FOR YEARS, SHE ATTENDED HER FIRST YOGA CLASS 10 YEARS AGO AND WAS INSTANTLY HOOKED. YOGA QUICKLY BECAME HER PRIMARY FORM OF FITNESS TRAINING. SHE COMPLETED HER 200 HOUR CYT IN THE SPRING OF 2011, AND HAS BEEN TEACHING SINCE AT VARIOUS STUDIOS INCLUDING Y2 YOGA, LAUGHING BUDDHA YOGA AND CHARLOTTE YOGA. SHE HAS ALSO BEEN PRIVILEGED TO TEACH THE COMMUNITY CLASS AT OMB YOGA ON TAP SEVERAL TIMES. HER PASSION FOR TEACHING CONTINUES TO BE FUELED WITH EACH CLASS. SHE PREFERS A STRONG ASANA PRACTICE THAT ENCOURAGES HER YOGIS TO FIND THEIR EDGE BUT ALSO GIVES THEM PLENTY OF OPPORTUNITY FOR MODIFICATION. SHE HOPES TO LEAVE THEM FEELING POWERFUL YET PEACEFUL EVERY TIME THEY COME TO THEIR MATS. BEYOND YOGA, ANN IS PASSIONATE ABOUT HER FAMILY, INCLUDING FOUR AMAZING CHILDREN, MUSIC, COOKING AND THE OUTDOORS…ESPECIALLY THE BEACH! "I live a very fast paced life! The Gemini in me usually leads to me having my hands in more fires than one at a time! I am the Business Manager and heavily involved in Event Planning for a very intense lifestyle company known as Heights Entertainment. So Yoga is where I find peace and solace at the end of the day! Or as I like to say, Yoga is the Yin to my Yang. From a very early age, fitness and health played a major role in my everyday life. Three of my brothers and sisters played Division 1 college basketball. My youngest brother is a successful professional basketball player overseas. I decided that athletes would be my primary but not my only focus. fter a 10 year love affair with Yoga, I decided that I wanted to share my love for this art form with those around me. This led to me acquiring my 200 hour Ashtanga Teacher Certification and becoming a Yoga Alliance Certified Instructor. I then went on to complete my Yoga for Athletes Certification and have since worked with some of the top Teams and Athletes in the country teaching them the benefits of Yoga for Athletes. you can take your game to the next level, both on the court and in the game of life. As she furthered her practice, she loved the physical work out she got, but was intrigued by the spiritual and emotional exploration she began to experience. After trying different styles and lineages over the the years, Jenna decided she wanted to share her passion for yoga with others. She studied under Lizzy Hoffman in Charlotte and received her 200 RYT in July of 2015. Her style of yoga is challenging with a great emphasis on self-discovery and acceptance. Jenna's classes will push you physically and will encourage you to create space in your life for opportunities you may have never dreamed of. Come and explore the possibilities! In Ahmed's Vinyasa Flow and Power Yoga classes you'll build strength, improve your balance, focus and flexibility while having a few laughs along the way. "My yoga journey began when I recovered from congestive heart failure, and I walked into a class at Yoga One. I was 26 when diagnosed, and now, at 37 years old, I am living life to capacity with my loved ones and my yoga mat at my side. I am forever a student of the craft, and when I teach, I embrace each class as an opportunity and a privilege to connect with my students, as WE explore our most authentic sense of self together." The Charlotte Ballet will be participating in Yoga On Tap this Tuesday! Come our for a great time and meet their awesome dancers! Rodolfo discovered yoga in 2014 while training with the Miami City Ballet School. Practicing yoga daily helped Rodolfo cope with the constant stresses and demands of being a ballet dancer. It has taught him how to embrace, trust, and send love to every part of himself. Rodolfo continued to practice yoga while dancing professionally with Ballet Austin and later decided to stop dancing and continue his passion for yoga, as well as his love for teaching. Rodolfo’s teaching is inspired by the idea that each time we step onto out mats, we are choosing the practice of creating space to slow down, turn inward, reconnect and explore. He combines alignment and flow to empower students to grow in their practice, inviting fluidity, strength and grace. He will be a founding team member at Lifetime Athletic Charlotte opening up in early December, near Ballantyne. Kellen is a lighthearted, non-judgmental yoga instructor who is passionate abou creating a welcoming environment so that all students feel comfortable in her classes. hroughout her challenging yet accessible sequences, various expressions of poses are offered so that everyone can be supported. You can expect to move and breathe slowly while building heat and listening to atmospheric musi, ending with a long, rejuvenatin savasana and a cultivation of gratitude. Her students describe her as uplifting and encouraging, caring and gifted, but most importantly - they feel accomplished, peaceful, grateful and happy when they leave her classes. Kellen can be found teaching at Siskey YMCA and Total Being Yoga in Mint Hill. 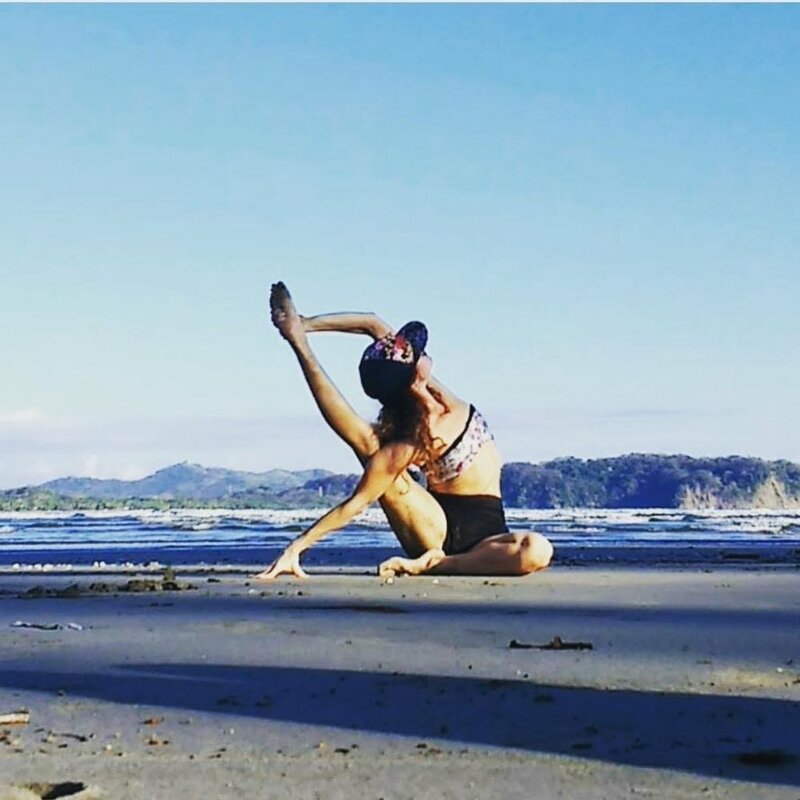 "Because I was a competitive dancer and athlete from the age of three, through my first year of college, the physical aspect of yoga was something that seemed to come naturally to me. Following college, I logged a lot of miles in my running shoes, and I completed several half marathons. It wasn’t until 2008, when I showed up for my very first hot class, that I quickly realized how much I missed the graceful movement of the body. Since that day, yoga has become one of my deepest passions that allows me to discover new territory, both physically and mentally. I now use my mat as a space to gain clarity and to strengthen my body, mind, and heart. I completed my 200- RYT with Grace Morales in October, 2013 and completed my 500- RYT with Grace Morales in May 2016. As a teacher, I guide my students through a practice that invites them to move through postures with intention and encourages self- study. From this place, students have the opportunity to practice the power of possibility through poses like arm balances, inversions, and deep twists. " Christina Longobardi Paradiso has been practicing and teaching yoga since college. With a background in performance, her journey has included a post college performance stint in NYC followed by a few years in the country woods of Virginia for some soul searching, medical massage school and ashtanga yoga teacher training. Since 2010, she has been living as a bodyworker, yoga and wellness teacher helping to fuse the gap between people and their bodies. One of Christina's favorite experiences was traveling to the burbs of Detroit, Michigan to study with Johnny Kest at Center for Yoga for a 200 hr intensive in 2012. Since 2011, Christina has travelled near and far to the ACC and NCAA Swimming and Diving Conferences and Olympic Trials as the Medical Sports Massage Therapist for the NC State Wolfpack. Her hobbies include long solo car trips to beaches far and wide and hip hop. She keeps a home office in Southend Charlotte when she is not traveling for all of her bodywork and wellness clients. "I have been loving and teaching yoga for over 15 years. Within the past four years I have been teaching for the Life Time Matthews club. I was quickly drawn to Life Times yoga style LifePower Yoga. My first LifePower yoga class was taught by Jonny Kest the mastermind behind this yoga style. Our LifePower Yoga Vinyasa is a dynamic and challenging flow that helps bring participants to their edge. We create space to allow the student to let their breath drive the free flow of moments. I am a certified LifePower yoga instructor as well as a certified LifePower Yoga faculty member. I have a passion to bring people into this practice to love the freedom of movement and liberation to truly find themselves in their practice." Life Time – The Healthy Way of Life Company, 2902 Corporate Place, Chanhassen, MN 55317. Competing in stair climbs across the country, Suzanne is currently ranked among the top 10 female tower runners in the U.S. and ranks 2nd in her age group. She and her husband, Joe, are currently the volunteer race directors of The Stephen Siller Tunnel to Towers Stair Climb held at the Duke Energy Center. This years climb is on Saturday, April 29th beginning at 8:00am. The Siller Family started the Stephen Siller Tunnel to Towers Foundation to honor the memory of their brother, Stephen, a New York City firefighter (FDNY) who lost his life on September 11, 2001 after strapping on his gear and running through the Brooklyn Battery Tunnel to the Twin Towers. The goal of the Stephen Siller Tunnel to Towers Foundation is to continue Stephen’s legacy by supporting our nation’s first responders and service members. Building for America’s Bravest, a proud program of the Stephen Siller Tunnel to Towers Foundation, constructs specially adapted smart homes for our most catastrophically injured service members. What does 343 mean to you? That’s the number of firemen who died on September 11th. To celebrate these heroes and honor their legacy, join Suzanne in climbing the Duke Energy Center in April. All are encouraged to register for the climb and to form a team. For more information and to register, visit https://www.crowdrise.com/T2TTowerClimbCharlotte. By incorporating the physical and spiritual aspects of yoga together, her classes at Charlotte Yoga link the application of alignment, meditation, intention and prayer, creating an inner journey towards healing and empowerment.